When Gao Hong was young, they called her "the little black kitten." She was 12 then and a member of a song and dance troupe based in north central China. Every morning Gao would rise early to practice her instrument, the pipa, in a tiny furnace room, to protect herself against the bitterly cold Chinese winter. Flecks of coal soot from the burner gathered around her eyes, giving her a feline appearance. The nickname quickly followed. Four decades later, Gao is sitting in a St. Paul coffee shop, warmly wrapped against a Minnesota winter, but altogether in a more comfortable position. The journey from her childhood in Mao Zedong's China, where her mother feared she would be sent away from the family home in Luoyang to one of Mao's countryside communes, has been long and remarkable. Gao's three years with the song and dance troupe were followed by six years catching up on her delayed education. Then, after a grueling series of tests, she gained entry to the highly prestigious Central Conservatory of Music in Beijing, as one of only two pipa players admitted that year to study with Lin Shicheng, a master of the instrument. It was a life-changing moment. 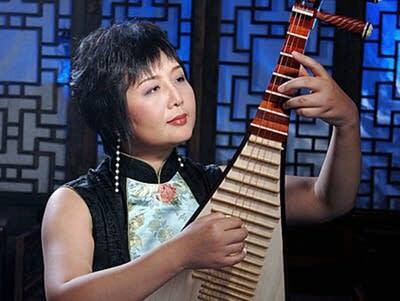 Gao describes Lin Shicheng as the "Ravi Shankar of the pipa," and her face lights up as she talks about the instrument (pronounced PEE-pa), which resembles a lute but is held in a vertical position for playing. "The pipa goes back 2,000 years," she explains. "It was played for emperors in a court setting, to accompany opera, and also for folk music. It's an ancient Chinese instrument." Gao's relationship with the United States began in 1994, when she came here on tour as a soloist. In Minnesota, she met her future husband and has fond memories of needing a translator at their wedding, because her English was so shaky. In the quarter-century since, Gao has continued to live in the Twin Cities, and is currently a senior lecturer at Carleton College in Northfield  the only U.S. liberal arts school, she says, where you can do a music major in Chinese instruments. Besides her teaching duties, Gao remains an avid performer on the pipa and has a clutch of acclaimed CD recordings to her credit. Her latest project is a collaboration with the Syrian musician Issam Rafea, an expert player of the oud (pronounced OOD), a type of Arabic lute. Rafea came to Carleton College a year ago, at Gao's invitation, to teach her students about Arabic music. At the end of the semester, Gao suggested that she and Rafea book studio time together to make a recording. The result is Life as Is, a new CD exploring "the blending of ancient souls from Syria and China," recorded on a rainy summer day at the Salmagundi Recording Studio in Northfield. As Gao tells it, the sessions for the new CD were far from conventional: "There was no talking between Issam and me in the studio, no discussion of which key or scale to play in, or the form or theme. It was 100 percent improvisation." Their rapport, Gao says, was immediate, as if the two musicians "had worked together for years, if not lifetimes." The recording was, however, not without its practical difficulties. "The two instruments are both in the lute family," Gao explains, "but they are very different. The pipa has frets, for example, and the oud doesn't." The biggest challenge technically was in marrying the tuning systems used by the two instruments together, as they are not naturally aligned. "Because the oud uses quarter-tones, I constantly had to push and bend, say, my C-sharp to a place between the C-sharp and D, to match Issam's playing," Gao says. The give and take between the two  the pipa a sensitive, at times sensual, soprano voice; the oud a soulful baritone  eventually resulted in 12 tracks being recorded. The titles  "Walking the Distance," "Summer Rain," "Hidden Dance"  were mainly added afterward to summarize the mood or atmosphere of a particular improvisation. For Gao, the pipa's unique ability to tell stories and illustrate them make it an ideal instrument to engage in this type of musical "conversation." "On my pipa, I can imitate the sound of water, rain, geese, a cannon shot, a woman crying, or an ancient battle," she says. "It's not just notes; for me, the pipa is the best way of telling a story without talking." The 12 stories told on the Life as Is CD have plenty of examples of Gao and Rafea using their instruments to paint particular emotions or situations. Ultimately, though, Gao views the project as symbolizing something deeper, at a period when peaceful international dialogue seems an increasingly rare commodity. "Life as Is is about how two different artists, from two totally different countries and totally different backgrounds, can meet in the middle and collaborate," she says. "I think we worked perfectly together."